Nick Muncy is a pastry chef who is currently the founder of the TOOTH-ACHE, a culinary magazine made for chefs by chefs. He is also currently sharing recipes on his website NICK MUNCY. 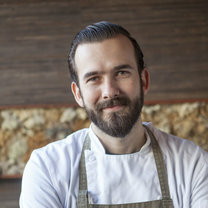 After graduating from the Art Institute with a degree in Culinary Arts, he went on to refine his skill under the best chefs in Los Angeles and San Francisco. "All the yakitori is super delicious, but here, I always save room for dessert. The tower of soft serve doused with sweet soy is a perfect balance of sweet and salty." "One of my favorite sandwiches, and it goes great with beer. I get it with a fried egg wedged inside, because they'll do it, and I never pass up a fried egg." "The decorated bar has an awesome atmosphere and really great rum/tiki drinks. The cocktail list is huge, but so far, every one I've tried has been delicious and fun." "The duck larb is spicy, sour, aromatic and oh so good. It's a great starter to share. Just make sure the chili peppers make it onto the other person's spoon." "Their viennoiserie is always beautiful, and my favorite to snack on is the kouign amann. It's great with coffee and perfectly sweet. I only feel bad for all the flakey crumbs I leave behind from eating it so fast." "The sushi here is always amazing. I love how each different fish is treated in a specific way, whether it's seared with a torch or served simply with citrus. They always have a wide selection of great fish, and if they have the deep sea uni, order it."